This page deals with event mechanics. For an overview of all events in the game, see list of event lists. 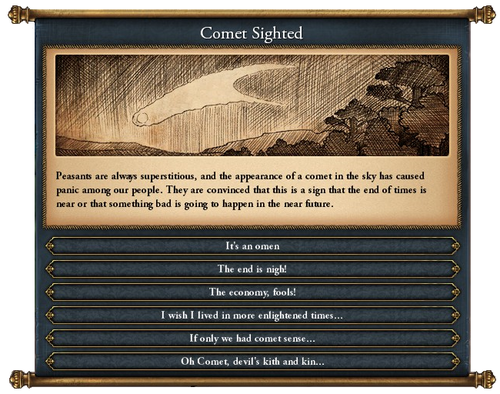 Events occur throughout the course of play of EU4. There are a whole range of events in the game, which can result in positive, negative and mixed outcomes for a player's country. They take the form of a pop-up notification on the player's screen, which may present a player with a choice, or may simply inform the player of the consequences and require they acknowledge the event has occurred. Please help improve this article or section by expanding it with: more detail. Triggered-only events are events that occur as a result of a nation's actions. The events can happen to that same nation or to another nation altogether. The needed trigger can be as simple as one nation choosing a particular option in an event or complex as taking over a certain province, thereby enabling an event at another nation. The events are usually fired immediately or within a short amount of time from being triggered. Please help improve this article or section by expanding it with: information on how pulse events work. Pulse events are random events that happen within regular intervals of time. One of their main purposes is to provide interactions and a sense of randomness within the game. That being said, while the events are bound to happen they are still based on player's actions; for example, for an exploration event to fire, the player needs to have an explorer/conquistador in the process of exploration. The events are grouped together into different sets depending on their purpose (regular gameplay or mechanic related) and assigned weights within their respective sets. Each set is programmed to fire in regular time intervals. The time intervals range from yearly intervals and up-to 5 year intervals. It is important to note however that there are several same-year intervals and it does not mean they'll fire at the same time; for example, there can be two 5 year intervals firing in consecutive years. When the interval arrives an event is picked at random from within the set and fired. Events with higher weights have higher chances to fire more commonly than the lower ones. Having certain modifiers, idea groups, provinces etc. can increase or decrease some events' weights. 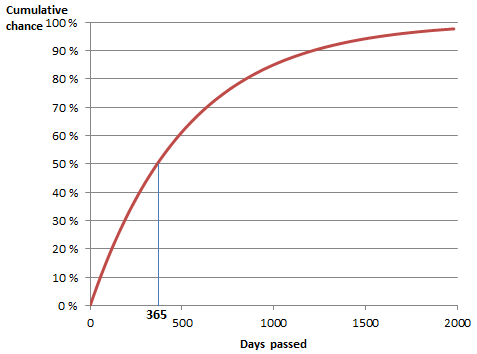 The chance of an event with an MTTH of 365 days firing within x days. Other events are not triggered but have a chance of happening at any time if their conditions are met. These events are controlled by a mean time to happen (MTTH). This mechanic determines the time it takes for an event to trigger, measured in months. Yet since events are probabilistic, there is a small chance an event may happen very quickly, or possibly never at all during the game. For example, if an event had a MTTH of 120 months, it means that usually it would take around a decade for the event to trigger. Certain factors may increase or decrease MTTH for an event, such as country's leader's quality, national stability, and so on. Assuming the probabilities are calculated in the same manner as in EU3, then despite the name MTTH is actually the median time, or half-life, for the event to trigger, i.e., the amount of time during which there is a 50% chance of the event occurring by that time, rather than the mean (average). where is the EVENT_PROCESS_OFFSET and is the median. where is the amount of time that passes. The approximation is best for a long MTTH. For a repeating event the number of occurrences within a given number of checks is given by a binomial distribution, which may be approximated by a Poisson distribution for a long MTTH. ↑ For a list of Pulse events see /Europa Universalis IV/common/on_actions/00_on_actions.txt. This page was last edited on 19 November 2017, at 10:23.